- Check seals around your house. Faulty door and window seals will become quite obvious with the first downpour. And don't let a roof leak get away from you. Get names and numbers of honest and trustworthy roofers now. Then in a pinch, you already have the information you need. - Pick up your yard. Secure outdoor toys and furniture. Winds can get quite gusty during these storms. I know I'm not the only one who has had to retrieve chairs from the bottom of my pool. - Get out the flashlights and restock batteries. I LOVED when the power went out on summer nights as a kid. Busting out flashlights and candles was the best. You'll want to make sure those kiddos that are afraid of the dark have their own personal flashlight in their room. Thankfully my kids are all stocked up because great-grandma has a flashlight Easter egg hunt each year. - Prepare a 72 hour kit. Of course I've never had to use mine in the 12 years I've had one, but preparedness never hurt anyone. A 72 hour kit is a collection of basic items you may need during an emergency. 72 is the number of hours the kit will sustain you and ideally it is small enough that you can grab in case of needing to evacuate. Things I include in my 72 hour kit are water, simple non perishable foods (peanut butter, canned fruit, gum, jerky...), cash, extra clothes, soap, matches, toothbrush, duct tape (cause I'm convinced duct tape will always help save the day), first aid kit...you can check out site like this one here to help you create your own 72 hour kit. If anything, having a 72 hour kit will give you peace of mind. - Have a plan. If the power goes out for too long and heat gets too bad, where are you going to go? Where is your meeting point if your lines of communication are down? What is the plan for your pets? Do your pets have proper identification? No one wants their pets to run away because they are scared of all the thunder, rain and wind. - Have your camera ready. Beautiful pictures are just one click away. My husband has been known to chase a storm or two for just the right shot, but always use caution. Washes flood quickly. Never think your car will be the one to make it through a flooded wash. It won't. - Plan a celebration! Start some traditions now! It doesn't have to be big or Pinterest perfect, but if you have kids, think of a way to celebrate the arrival of the first storm (okay, even if you don't have kids). This will help ease worried minds and help teach the importance of monsoons to our dry desert. You could possibly celebrate the first monsoon rain by making a special treat (examples: make an edible mud pie, smores, or homemade popsicles.) Do a special activity (examples: set out rain buckets to measure rain, use washable paint to color on your body and let the rain rinse it off, have a fun book on the desert that you read, paint in the rain. Check out this blog for fun rain painting ideas.) You can always watch an Indian Rain Dance to celebrate as well. 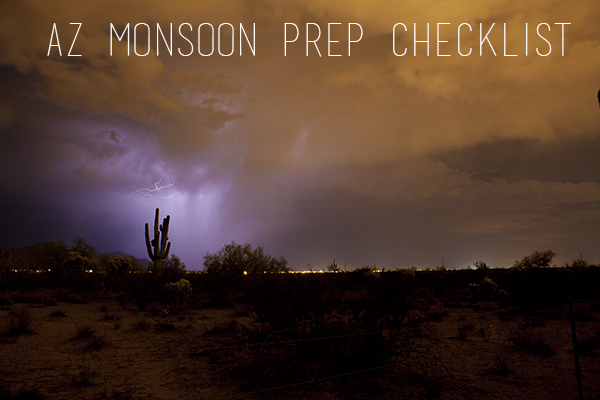 We hope everyone is safe this monsoon season and we hope it is a great one! How did you fare on this checklist? What additional things do you do to prepare for the monsoons?